Do you need to keep your pet away from areas in your home? 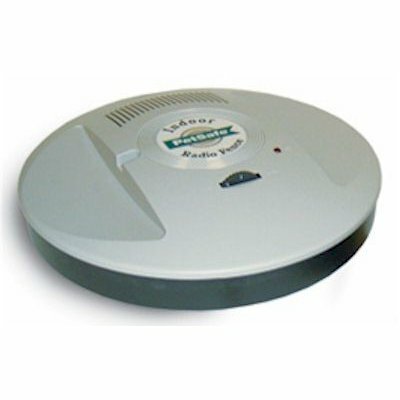 The PetSafe Indoor Radio Fence Transmitter is safe, easy to set up and very effective. Just place the small, compact transmitter (about the size of a Frisbee) near the area you want to protect. Adjust the range from as little as 2 feet to up to 10 feet. 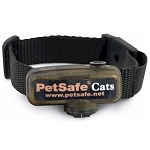 When your pet gets near the signal a warning beep sounds on the collar (not included). If he continues to approach the protected area, a mild correction is given. You can use it to keep your pet out of a child's room, away from the kitchen table, off the counter or just about any area you need him to steer clear. 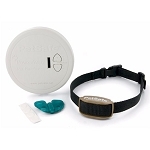 Protect as many areas as you need by getting additional transmitters and control multiple pets by purchasing additional collars. Put it anywhere, in a plant, next to the front door, hanging on a wall or in a drawer. Although the transmitter is designed for indoor use, it can also be used in a garage or under a covered patio where a 110 outlet is accessible. We've had this system for quite a few years now and it still works great. We were absolutely at our wits end with an insanely persistent Bengal cat, who we could not keep off the kitchen counters, stove top, sink, kitchen table, etc., among other undesirable areas of the house. We tried it all to no avail - citrus scented sprays, sticky paper, barriers, nubby plastic strips, etc. I swear he laughed at us while he patted pebbles from the windowsill plant into the sinkerator (yes, it broke the next time we turned it on). We were literally ready to re-home him when we lucked upon this system (at the time, the cat version didn't exist). What a godsend! It really works, and very quickly too. The only challenge is the circular radius of the transmitter, which forces you to get a little creative with placement. Not a big deal in the long run. I was somewhat concerned about the shock part, so I tried it on myself first - definitely gets your attention, but won't cause any harm. It is actually pretty humane since it will only need to jolt your pet once or twice before they'll react to just the tone. It works so great that we later bought the stubborn dog version to prevent our puppy from chewing up some expensive surf boards. If you're considering buying this system, go ahead and do it. You won't be disappointed. Helped bring peace to our house again. This really works but other reviews are right. The signal goes through floors but we were able to set it in a three foot setting that worked for us. The dog went to the "marked" area once on a setting of 2 and that was it!! This product works great, the only problem is that it works too good. We found that the system would actually work through the floor and when the dog was downstairs (where he was allowed to be), he was getting a shock. You need to make sure that the box is put in a really good spot. This is the only thing I can use to keep my beagle out of the kitchen and away from food and garbage pail. I also use it in conjection with the outside invisible fence. I wouldn't have a dog without it. Actually this is my second indoor one. I have the first at the bottom of my stairs.....beagle loved getting into cat liter and no amount of training would stop her. The indoor fence product I purchased worked exactly as intended and has kept our dog from jumping on the sliding glass doors. We have used this product for a couple years and just added another--to keep our cats out of a storage loft (where they doing their business) and out of our bedroom. Yes--you can train your cats with these and I highly recommend this product. We use PetSafe Indoor Barriers to keep our large (85 lbs.) dogs out of the front of our house. Our furniture thanks us, as do guests who arrive at our front door! I have 9 transmitters spread through-out my house to keep my cat off kitchen counters, and away from areas where I don't want her to be. I do wish they would make a smaller, battery operated version that I can put on my kitchen table as that is the only area that currently doesn't have a transmitter and needs one badly. I don't want a power cord stretching from the outlet to the table, as someone could very easily trip over it. We are actually using it to keep a neighbor cat out of our house (with the owner's cooperation). We have 2 transmitters, each one just outside the door and we set them to the Maximum setting. Now the cat stays about 18 feet away from the transmitters! Our cats can go in and out, but the neighbor cat keeps its distance. We are thrilled! Purchased the indoor fence transmitter and the cat fence collar together. Best thing I ever got my cat. She kept using the doggie door which is scary. We have coyotes in my neighborhood. It only took one zap to keep her in the house. I'm keeping the collar on her for several weeks in case she gets brave. Other than that I am so glad I found this product. Highly recommend this to anyone with a poaming cat problem. We bought the indoor cat barrier and 3 extra transmitters to dissuade our store cat from attempting escapes to the outside. After a couple of trips too near a door, he now has no desire to try his former trick of lying in wait near a door for it to open. My only criticism is that the transmitter is a little large, about the size of a Frisbee. Otherwise, a "5". It really works good. Keeps my cats out of the rooms I don't want them to be in. They learned fast not to go near the disc. 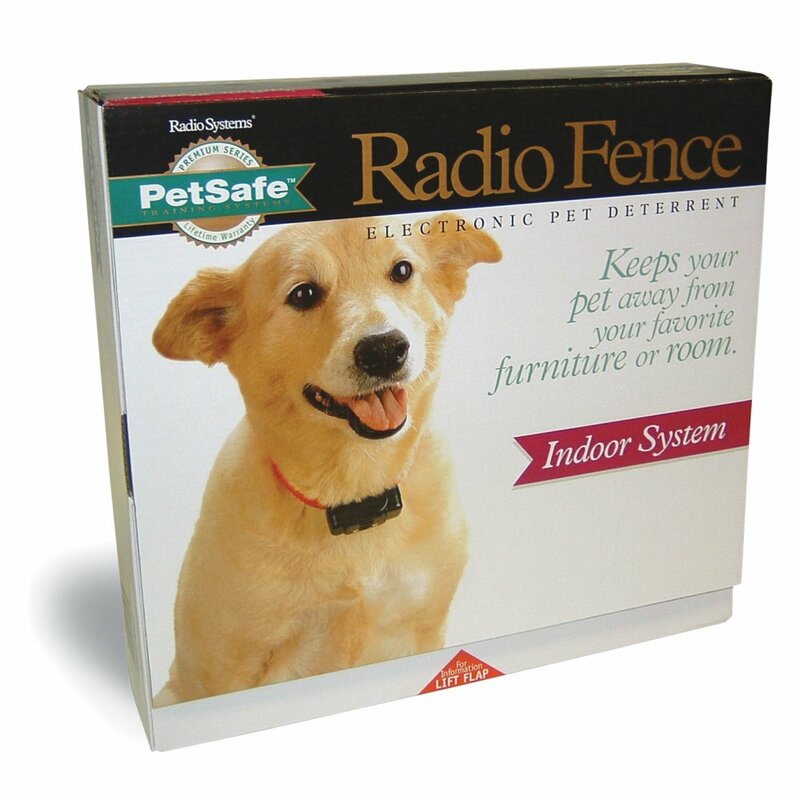 Q: Can I buy replacement collars for pets are indoor radio fence systems? If you are using the PIRF-100 Indoor Barrier the collars listed below will work with it. Q: This product can be used in a garage? Even when cars are parked in garage? A: Yes the cars shouldn't cause any sort of signal interference. 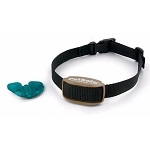 Q: I have an existing 4/8Khz outdoor fence and collars from DogWatch. Will this indoor transmitter work with my existing collars? Unfortunately, the collar you have is not compatible with this transmitter. 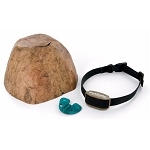 For information on collar options please feel free to call us at 800-941-4200. We are in the office Monday-Friday from 8am-5pm eastern time. Q: Can this work with invisible fence boundries plus collar? Unfortunately PetSafe brand products and Invisible Fence brand products are not compatible.